Reward charts for instrument practice! No matter how fun it is to start an instrument, a child's enthusiasm often changes when it comes to practicing. 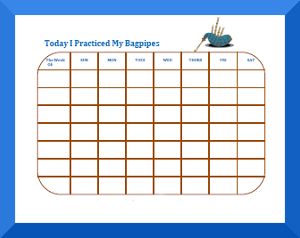 Our instrument theme behavior charts are a fun way to motivate kids to practice! Each practice session that can be marked on a behavior chart contributes to a feeling of accomplishment and success! We are happy to add any instruments. Just drop us a line!